$7.75M for mapping circuits in the brain A new NSF Tech Hub will put tools to rapidly advance our understanding of the brain into the hands of neuroscientists. The technology exists to stimulate and map circuits in the brain, but neuroscientists have yet to tap this potential. Now, developers of these technologies are coming together to demonstrate and share them to drive a rapid advance in our understanding of the brain, funded by $7.75 million from the National Science Foundation. “We want to put our technology into the hands of people who can really use it,” said Euisik Yoon, leader of the project and professor of electrical engineering and computer science at the University of Michigan. By observing how mice and rats behave when certain neural circuits are stimulated, neuroscientists can better understand the function of those circuits in the brain. Then, after the rodents are euthanized, they can observe the neurons that had been activated and how they are connected. This connects the behavior that they had observed while the rodent was performing a controlled experiment with a detailed map of the relevant brain structure. It could lead to better understanding of disease in the brain as well as more effective treatments. In the nearer term, the details of neural circuitry could also help advance computing technologies that try to mimic the efficiency of the brain. Over the last decade or so, three tools have emerged that, together, can enable the mapping of circuits within the brain. The most recent, from U-M, is an implant that uses light to stimulate specific neurons in genetically modified mice or rats and then records the response from other neurons with electrodes. Unlike earlier methods to stimulate the brain with light, with relatively large light-emitters that activated many nearby neurons, the new probes can target fewer neurons using microscopic LEDs that are about the same size as the brain cells themselves. This control makes the individual circuits easier to pick out. The “pyramidal” neurons that cause action—rather than inhibit it—will be genetically modified so that they respond to the light. To visualize the structure of pyramidal cells and other kinds of neurons, researchers need a way to see each tree in the brain’s forest. For this, co-investigator Dawen Cai, U-M assistant professor of cell and developmental biology, has been advancing a promising approach known as Brainbow. Genetically modified brain cells produce fluorescent tags, revealing each cell as a random color. When it is time to examine the brain, a technique to make the brain transparent will remove all the fatty molecules from a brain and replace them with a clear gel, making it possible to see individual neurons. It was pioneered by another co-investigator, Viviana Gradinaru, who is a professor of biology and biological engineering at the California Institute of Technology. “Not only may we understand how the signal is processed inside the brain, we can also find out how each neuron is connected together so that we achieve structural and functional mapping at an unprecedented scale,” Yoon said. While these are the central tools, others at Michigan are working on methods to make the electrodes that record neuron activity even smaller and therefore more precise. In addition, a carbon wire electrode design could even pick up the chemical activity nearby, adding measurements of neurotransmitters as a new dimension of information. To share these new tools, the team will bring in neuroscientists for annual workshops and then provide them with the hardware and software they need to run experiments in their own labs. For the tools that prove to be most useful, they will seek commercialization opportunities so that they remain available after the project ends. The project is called Multimodal Integrated Neural Technologies (MINT) and has been awarded as a 5-year National Science Foundation NeuroNex Technology Hub. Other co-investigators include Cynthia Chestek, U-M assistant professor of biomedical engineering; James Weiland, U-M professor of biomedical engineering; Ken Wise, the William Gould Dow Distinguished University Professor Emeritus of Electrical Engineering and Computer Science at U-M; and György Buzsáki, professor of neuroscience at New York University. Seymour and Yoon are also affiliated with biomedical engineering at U-M. Cai is affiliated with Michigan Medicine. The neural probes with micro LEDs are made in the Lurie Nanofabrication Facility at U-M.
Video Caption: John Seymour explains how the new grant will help neurotechnologists further research to enable a better understanding of the pathways in the brain. 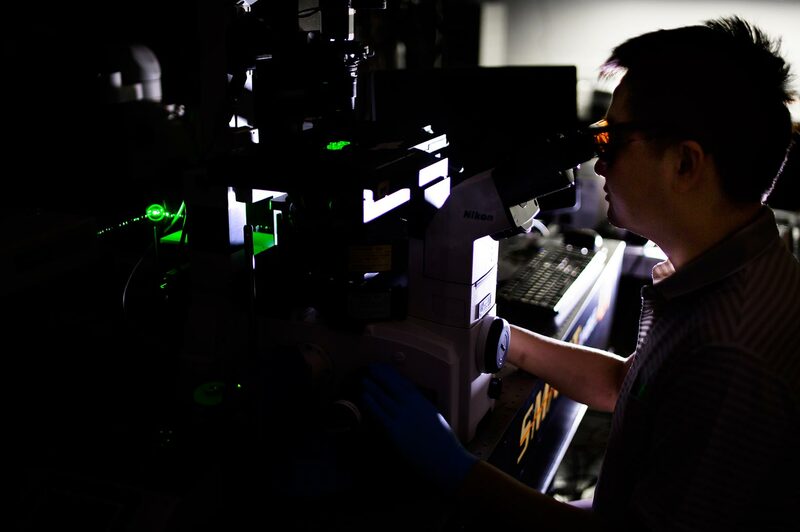 ‘Sister cell’ profiling aims to shut down cancer metastasis Michigan engineers release individual cells from a specially-designed chip using laser pulses. In work that could improve understanding of how cancer spreads, a team of engineers and medical researchers at the University of Michigan developed a new kind of microfluidic chip that can capture rare, aggressive cancer cells, grow them on the chip and release single cells on demand. For the first time, they can easily compare two different “sister” cells – born of the same original cancer cell – to explore how different genes are activated and deactivated as cancer cells divide and spread. Studies with the new chip could also reveal why some cancer cells are resistant to drugs. The ultimate goal of the project – led by Euisik Yoon, a professor of electrical engineering and computer science and corresponding author on the paper in ACS Nano – is to find out what drives the “self-renewal” processes that enable these aggressive cancer cells to behave like stem cells. These cells are known as cancer stem cells – they are capable of dividing and turning into different kinds of cancer cells, with different genes turned on or off. Cancer researchers believe that if the stem-like properties can be switched off, the cancer will not be able to grow and spread. “When a tumor forms, some cancer stem cells maintain stemness, while others are differentiated. By understanding this, we will know more about tumor formation and discover ways to inhibit it,” said Yu-Chih Chen, a research scientist in electrical engineering and computer science and co-first-author on the paper. The base of the new chip is composed of carbon nanotubes covered in a plastic coating. When a cancer cell settles on the chip, it sticks itself to that coating. To release the cell, the researchers shone extremely short pulses of laser light near it. The light is readily absorbed by the carbon nanotubes, flash-heating them, while the plastic insulates the cell. The heat causes trapped air between the nanotubes and plastic to expand, blowing a bubble under the cell. When the bubble bursts through the plastic, the cell detaches. Then, the cell can be flushed out of the chip and captured for genetic profiling. IMAGE: The laser creates a bubble under the cell that bursts out and releases the cell so that it can flow out of the chip. Yu-Chih Chen, Yoon Lab, University of Michigan. Most existing methods for freeing individual captured cancer cells are either damaging to the cells or else cannot get them out of the chip reliably. The laser was precise enough that it could detach one side of a cell, leaving the other side anchored. And the bubble detachment process was so gentle that even surface proteins on the cell membrane were unscathed. The surface proteins are an important nondestructive avenue for identifying cancer stem cells. To begin exploring the differences in gene expression between sister cells, the team first looked at a gene called Notch, which is associated with both normal and cancerous stem cells. If Notch was expressed in the daughter cells, it was a rough indication that the division was self-renewing. A Notch-positive cell could go on to produce two cells expressing the same gene, one Notch-positive and one Notch-negative, or two Notch-negative cells. Their analyses demonstrated that Notch does not serve as a sole indicator for a cancer cell’s stem-like properties. Other genes associated with stem cells could be switched on or switched off in daughter cells with either Notch expression. The task ahead of cancer researchers, with the help of the new chip, is to identify which of these genes are critical to a cancer stem cell’s self-renewing capabilities. If these can be shut down, forcing all cancer stem cells to produce only non-stem cells when they divide, it may be possible to subvert a tumor’s ability to grow and spread. “If we identify some key genes, or a potential drug target, then pharmaceutical researchers can develop a compound to hit this drug target,” said Chen. Drug testing inspired Yoon to develop this chip. On earlier chips, some cancer survived treatments, and he wanted to understand these cells better. Future experiments could lead to what some cancer researchers call “functional cures,” similar to the management of HIV. The cancer doesn’t necessarily have to be eradicated. Stopping the cancer from spreading may be enough to enable a cancer patient to live a healthy life. This work is reported in a paper titled “Selective photo-mechanical detachment and retrieval of divided sister cells from enclosed microfluidics for downstream analyses”, appearing today in ACS Nano. The study was funded in part by the Department of Defense and the National Institutes of Health. Euisik Yoon is also a professor of biomedical engineering. When fighting cancer, speed is of the utmost importance. A microfluidic chip developed by Michigan engineers has enabled a breakthrough in testing the efficacy of specialized cancer drugs. This means getting the right drug to the right patient in a fraction of the time. These chips could make a huge difference in how fast we can develop a new drug or nanodrug. Until recently, a cancer drug lab screening could test ten variables in one day. A new microfluidic chip developed by Michigan engineers can now test one thousand different variable in one hour. This allows doctors to more quickly identify the best treatment for the individual patient based on their type of cancer and biology. These chips are especially useful for testing photodynamic cancer treatments in which drugs are only activated when exposed to light. This kind of hyper localized cancer treatment reduces the negative side effects of other options, like chemotherapy. Euisik Yoon is a Professor in both the Electrical Engineering and Computer Science and Biomedical Engineering departments at the University of Michigan’s College of Engineering. Professor Yoon is also the director of the Solid-State Electronics Laboratory and the Lurie Nanofabrication Facility. His research focuses on MEMS, integrated microsystems, and VLSI circuit design. Individual parts of the brain can be activated and de-activated by shining light on the neurons, and researchers are using this ability to chart how different areas of the brain function. To zoom in on individual neuron circuits within the brain, more precise light sources are needed. Euisik Yoon, a professor of electrical engineering and computer science at U-M, is leading a team that will design and build these new light sources with a variety of lasers. The $2 million grant is part of the Brain Research through Advancing Innovative Neurotechnologies (BRAIN) initiative, a program championed by the White House and administered by the National Institutes of Health. Kensall Wise, the William Gould Dow Distinguished University Professor of Electrical Engineering and Computer Science at U-M, and György Buzsáki, the Biggs Professor of Neural Sciences at the New York University School of Medicine are co-investigators. The project is called “Modular high-density optoelectrodes for local circuit analysis.” Yoon is also a professor of biomedical engineering. Wise is also the J. Reid and Polly Anderson Professor of Manufacturing Technology, a professor of biomedical engineering, and a professor of atmospheric, oceanic and space sciences.